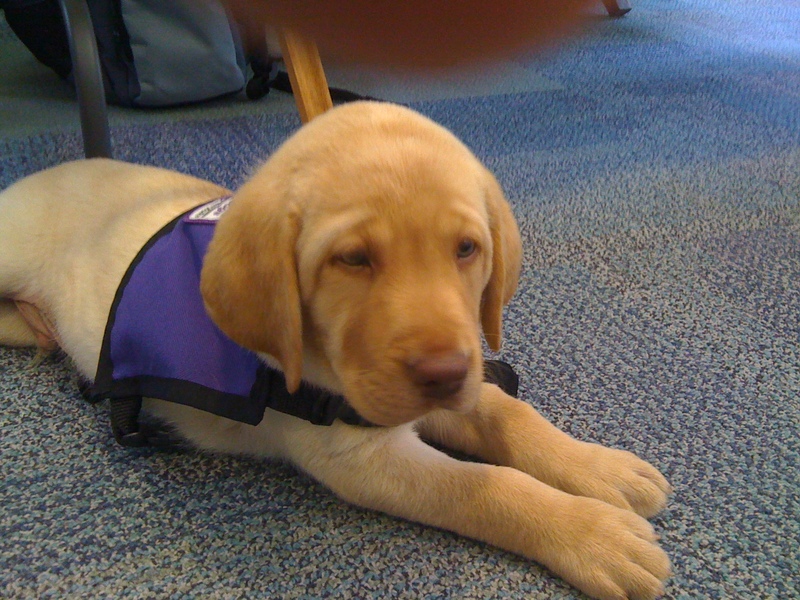 Are You Ready to Raise a Service Puppy? We’re expecting approximately 25 service puppies to be born in the next six weeks. One of those puppies wants to go home with you. 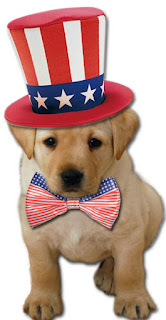 Are you ready to raise a service puppy? Each puppy will need a puppy raiser or puppy raiser family to welcome it into their home and hearts. Puppy raisers raise the puppy for about two years. During that time, they teach the dog basic obedience, great house manners, and a variety of other skills that the dog will use as a service dog. 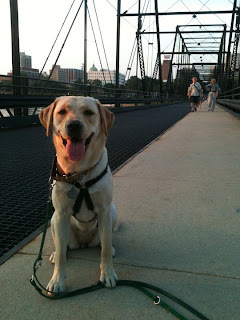 In addition, they take the dog on lots of public outings, car rides, and long walks in different places. Going to the bank? Take your puppy in training with you and practice down stays while you talk with the teller. Need milk for your cereal? Take your puppy and use a cart to practice loose leash walking beside it and maneuvering the aisles. While the puppy is in our program, the only costs you are responsible for are food and any toys, collars, leashes, etc. that you buy for the dog. No experience is necessary. We will teach you everything you need to know about training one of our puppies. We hold puppy classes several times a month, as well as public outings to places like Chocolate World, the airport, Cabela’s, Knoebel’s, the Strasburg Railroad, and Ghosts of Gettysburg tours. We currently hold classes in Harrisburg, PA and Bear Creek Township, PA. Our puppy raisers come from all over central PA, as well as Northeast Pennsylvania. We even have a few puppy raisers who drive in from State College. The only limit to the location of our puppy raisers is the puppy raisers themselves. As long as you’re willing to drive to puppy classes, outings, and vet visits, you can become a puppy raiser for SSD. 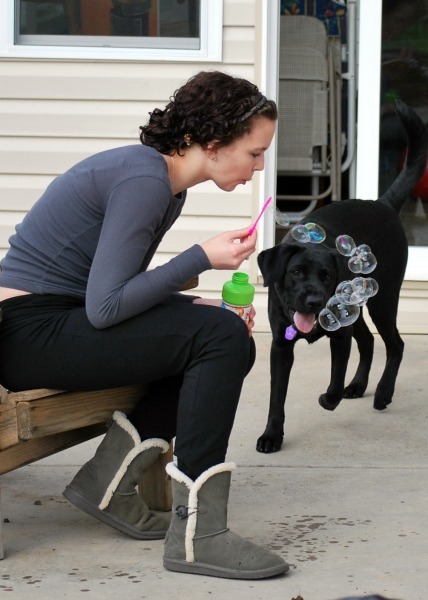 Raising a puppy to become a service dog is a fun and rewarding experience. By raising a puppy, you will change a life. Are you ready? Apply today. Susquehanna Service Dogs Needs You! This year, Labor Day is taking on a special meaning for SSD. We’re expecting four new litters of puppies in the next six weeks! We will definitely have our hands full with approximately 25 lab puppies expected. With so many puppies on the way, we’re going to need your help to provide all of the supplies and care these pups need to grow into future service dogs. For example, when all those puppies are being born, we will need lots of white towels, as well as heating pads to keep the pups warm. Other items we need include puppy crates, paper towels, hand sanitizer, storage containers, and more. All of these items are essential to keeping the whelping room clean, warm, safe, and organized for the mom and puppies. View the wish list and donate today. Thank you for helping these puppies get off to a good start! September is going to be a busy month for us. SSD Scotia and SSD Kirby are both going to have puppies! SSD Scotia was bred to SSD Sweet William. 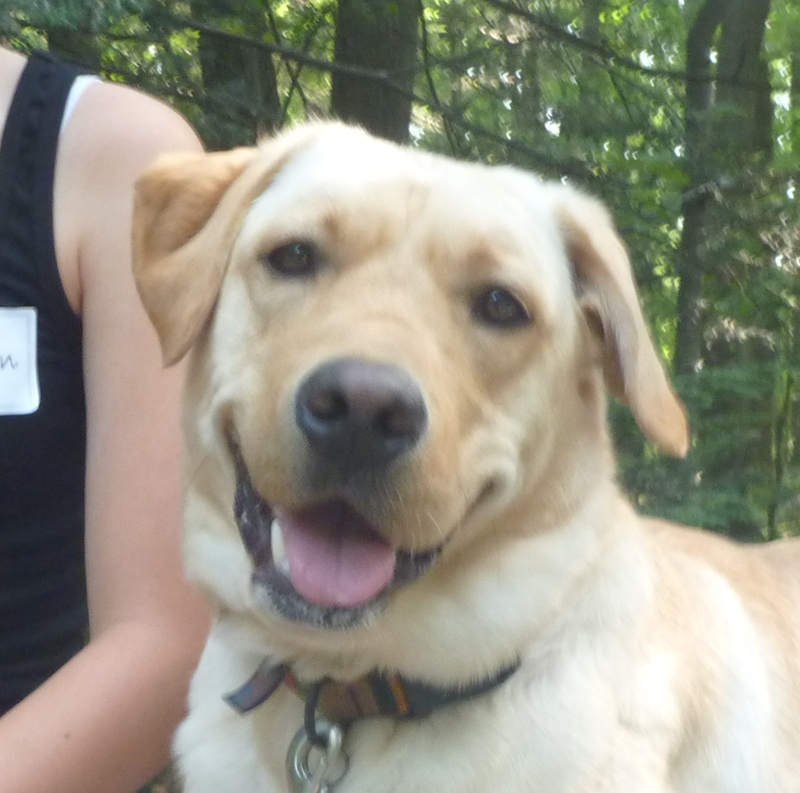 Will was SSD’s founding stud, a handsome yellow lab with a sweet temperament. Scotia is expecting 6 puppies. They should have some very nice pups! SSD Kirby was bred to SSD Meade, our newest stud. This will be both dogs’ first litter. 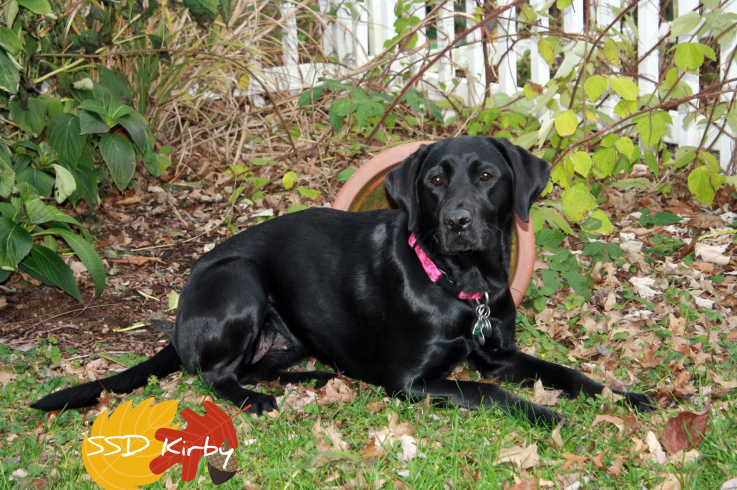 When Kirby had her ultrasound, the vet saw 7-8 puppies. We’re looking forward to meeting them! SSD Opal and SSD Julia were also bred. Opal traveled to the Guide Dog Foundation for the Blind and was bred to Elton, the handsome father of the Shakespearean puppies. Thank you to the Guide Dog Foundation for taking such good care of her during her stay! 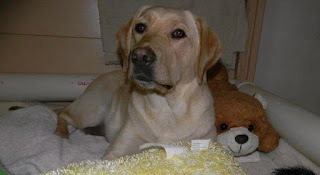 Julia was bred to SSD Fire, a big, dark yellow lab. We won’t know if these two dogs are pregnant until their ultrasounds. We’re looking forward to an autumn full of puppies! Luke has been working with SSD Laurel for several years, so they have had lots of time to bond. Laurel accompanies Luke to school and hangs out with him at home. “I am very happy to have Laurel,” says Luke. Here’s what he has to say about life with SSD Laurel. Hi, my name is Luke and I have SSD Laurel. 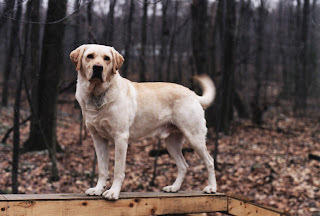 Laurel is a yellow lab. I have had her for three years now and she's five years old. Laurel is a service dog. She goes to school with me. She keeps me safe and service dogs do much more than that. They can control the light switch, open the fridge and freezer doors, and even pick up the phone. They can also bump you to tell you the doorbell is ringing or bump again to tell if there's a fire or something. Laurel doesn't like storms. She likes to hide anywhere in the house. We sometimes give her bones to make her feel more safe. Mostly, she hides in the library, and her second best place is upstairs in our room under the ladder to the bunk bed. Laurel is very cute and nice. She is sometimes in the computer room looking for food that we are eating while playing our computers. She eats her whole dinner in about 30 seconds. Mom always makes Laurel talk like she is talking. We love her, and that means she loves us. When I eat sausage for a snack, Laurel always looks at me thinking I will give her some. I might someday. Service dogs are very cute and can be very helpful. I am very happy to have Laurel. International Assistance Dog Week celebrates service dogs and all they do to assist their partners to be more independent. But these highly trained service dogs don’t make the journey on their own. 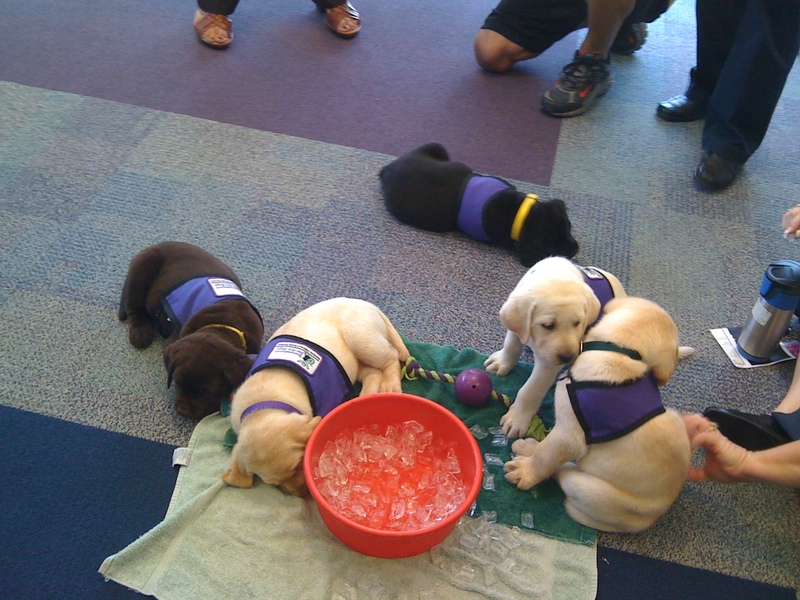 They are raised by a wonderful group of volunteers – our puppy raisers. Puppy raisers raise a puppy from the time it’s 8 weeks old until it’s 18 months old. During that time, they teach the dog good house manners, basic obedience, and a variety of other skills that the dog will need when it becomes a service dog. 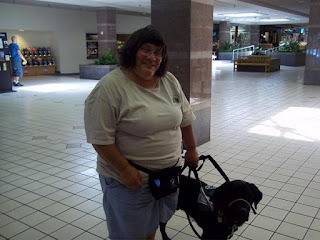 In addition, puppy raisers take the dog out in public to many different places, such as grocery stores, malls, amusement parks, movie theaters, restaurants, and more. 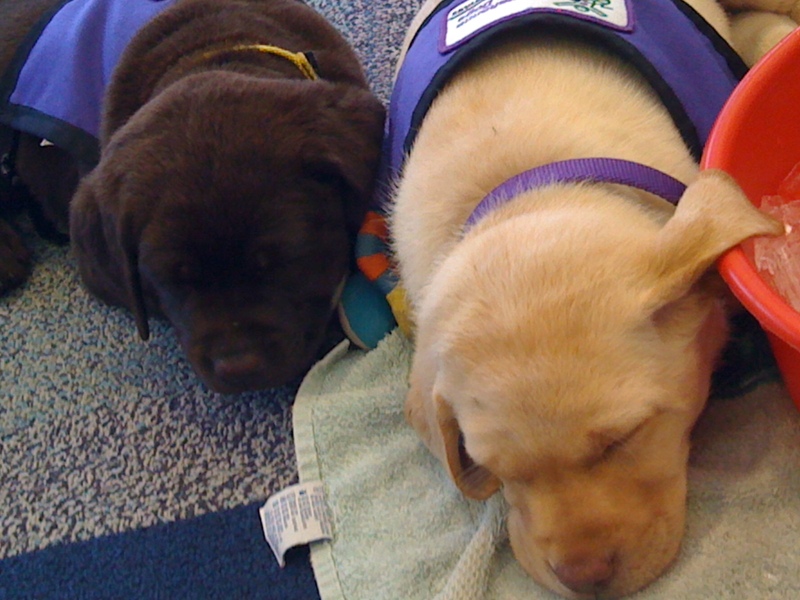 We talked with some of our experienced puppy raisers, and here’s what they have to say about raising puppies to become service dogs and ultimately giving them up to their new partners. Susan has been a volunteer with us for many years, and she has raised and trained eight dogs for us. Currently, she has SSD Midge, a breeding dog and a demonstration, interview and therapy dog for us, and SSD Julia, one of the Civil War pups that recently passed her evaluation to become a breeding dog for us. 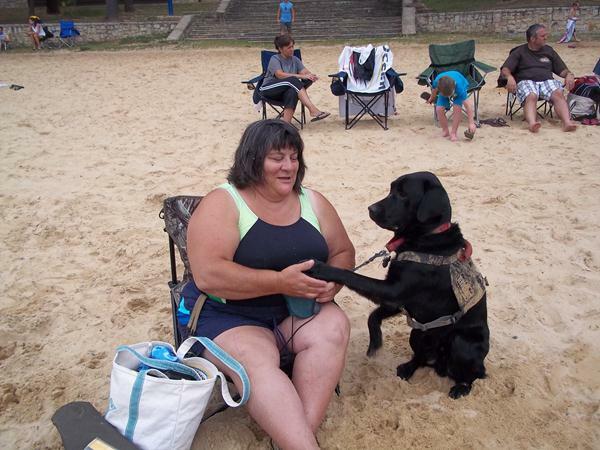 Giving up a service dog isn’t a time for sadness, although there are almost always tears. 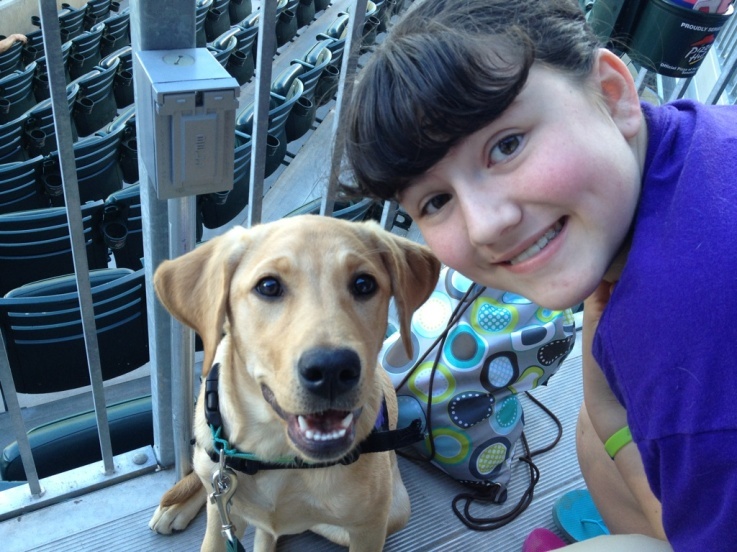 Giving up a service dog is a time for joy, happiness, and hope for the future. The dog that you give up today to become a service dog is going to change someone’s life in the next minute, hour, day, year. And that is why people volunteer their time and hearts to raise service dogs. 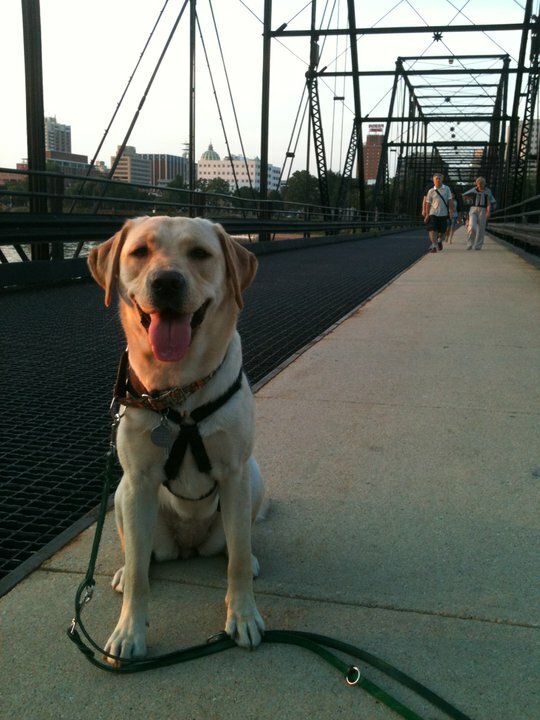 If you have raised service dogs or guide dogs, please share your stories and thoughts in the comments. Today, Governor Corbett ceremonially signed House Bill 165, legislation that will help service dogs and their owners. We are honored to have been invited to join the Governor for the signing of the bill. Sponsored by Representative John Evans, the bill allows for the owner or co-owner of a dog to be charged with a third degree misdemeanor if their dog attacks an assistance dog and the owner had knowledge of the animal’s aggression or if the animal has a history of attacks. Individuals found responsible for a service dog’s harm would be responsible for veterinary bills, replacement and training costs of a new service dogs, fines, and more. The passing of this bill acknowledges the importance of service dogs and the extensive training that goes into developing a service dog. Their extensive skills enable them to serve a person with disabilities to be more independent in their lives. “I’m happy to say H.B. 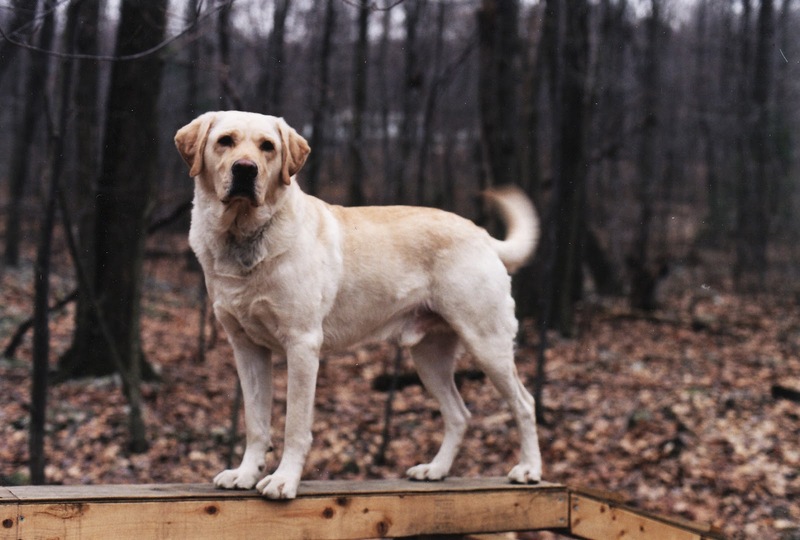 165, which protects the dogs that protect Pennsylvania citizens, is now a law,” said Corbett. We would like to thank Governor Corbett, Representative Evans, and the many people who had a hand in developing and passing this new legislation. The governor originally signed the bill on June 13, 2012. Read the full text of the bill. Keystone Human Services President Dennis Felty shakes hands with Governor Corbett. SSD is a program of Keystone Human Services Children & Family Services. Governor Corbett meets SSD November, one of our dogs that does demonstration, interviews, and therapy. SSD William Shakespeare lends a paw after the ceremonial signing of H.B. 165. 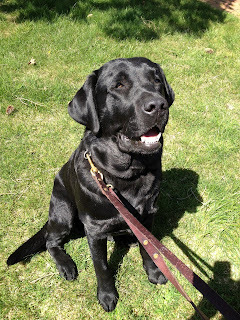 Guest post by Joan T.
Here’s what she has to say about her first month with Jagger. We came home from Team Training on Flag Day, which I thought was great because I wanted to wave a flag to everyone that we had passed our test and were finally a team. The drive home was tiring for me and maybe for Jagger, too. He fell asleep, and I didn’t hear a sound from him for the entire three and a half hour drive home. The first night, he was a little confused and very curious – there were so many new smells and sounds, and the air was different, and oh my, there was a cat! Roly missed having a dog around the house. It had been a year since I had a dog around the house, and I don’t think I realized the full extent of how much I missed it. One month after having Jagger with me, my back no longer hurts uncontrollably after I do laundry. Jagger picks it up and hands it to me to pin on the line. Soon, he’ll learn to drag the full basket outside and then back inside for me so I don’t have to carry it. He has already learned to “trash it” – throw out all of the pieces of paper and such that I throw at the trashcan and miss. Currently, we’re working on having him locate things and learn certain things alone. He’s also learning specific names or labels for items. He does make the time fly by, but he’s very patient when I don’t get up at 6:30 or 7 a.m. to give him breakfast, or when I don’t stop at the computer at 4 p.m. for his dinner. He likes to be by my side. Hearing the gentle snoring and the thump thump thump of his tail while he’s sleeping is just a delicious feeling, knowing that you’re not alone. The last few nights since we’ve been home from our camping trip, I’ve noticed that he likes to curl up next to my back in bed, which is very helpful for me. It’s great back support! 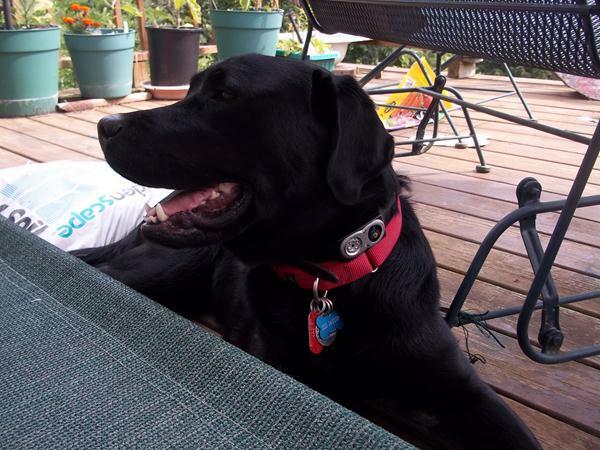 Jagger is also great at yardwork – he chews the grass and ate all the wild strawberries. I have five blueberry bushes, and at first, he nibbled on some of the branches with berries, but a quick “leave it” has taken care of that so far. I keep an eye on him, but he stays with me. While I’m picking, I often lose my balance, and he’s right there to stand next to my legs and prop me up. He also gets the fun of clearing the grounds of blueberries that have dropped to the ground. The silky feel of a sleek coat is soothing, especially to a spinner and knitter like me. Jagger has found my yarn to be very interesting and has learned that it is not a ball to play with. Because of the heat, I’ve had to cut back on my walking, but we still have playtime, which is something I had forgotten how to enjoy. I throw the ball for him, or have him jump through the hula hoop or chase bubbles around. We’re both working on times to “get silly” by dancing, whistling, or jumping about and singing or banging on a drum, or playing a harmonica. Jagger can’t do the drum or harmonica yet, but this play time is relief time and a stress outlet for both of us. In the same way, we’re both learning when it’s time to get to work and be businesslike, even if his working harness is not on at the time. I have begun to move out of my “comfort perimeter,” and did so in a big way by going camping in early July at R.B. Winter State Park in Union County. It was hot, but we managed to stay cool. 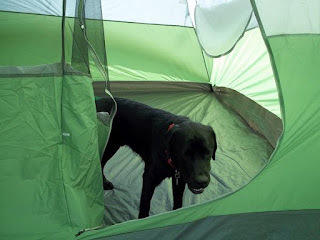 Jagger easily walked with me around the campsite on leash, following my pace, which varies. I had one very low sugar incident while camping and was not able to put my glucagon shot within Jagger’s reach. I had to keep it in the cooler because of the excessive heat. However, he bumped me gently a couple times when my blood sugar was beginning to drop. Since it was starting to rain, I thought he was just telling me he wanted to go into the tent. I think he recognized my sudden sweat and shaking, though. I unhooked his lead, and he went to the car door. I opened it and got my shot. He walked to the tent with me, where we went inside for some privacy, and he sat beside me while I tested my sugar and administered the needed medication. My sugar was incredibly low. Afterward, he sat by me and kept watching me, giving me his paw to let me know he was still there. When I started to feel better, Jagger stood up in front of me and gave me a big kiss. When I tested my sugar again, it was slowly coming back up. This is not the first time he has been with me when I’ve had to administer glucagon. I’m usually very upset after I have to do this, and having him with me makes me feel infinitely better. As he braced to help me up, I stood. He watched me, stood beside me, and slowly walked with me outside the tent so I could continue dinner. Crisis passed, he became interested in a little chipmunk, and I was able to laugh. 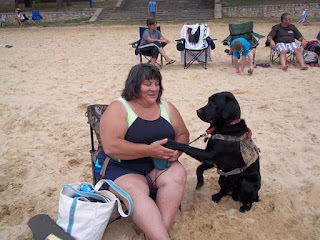 Since my first service dog, I have found that people have become much better educated about service dogs, their abilities, and why they are allowed to be where they are. Parents are instructing children, “That’s a special dog. He’s helping her, so you can’t touch him.” I usually thank the parent for telling their children that, and if we’re in a situation that I feel okay with Jagger, then I’ll explain to them that they’re right that you shouldn’t just pet a dog – even one without a vest – but sometimes if you ask the owner, they might let you. At that point, I will encourage them to ask me to be allowed to pet Jagger. I get a big kick out of how many times they’ll bend down and say, “Is it okay if I pet you?” Then I educate them a little further, saying “Oh, he can’t tell you. But if you ask me, you’ll get an answer.” They usually give me sheepish grins, and then they ask to pet my dog. My response is one I came up with a long time ago. With a certain voice timbre, I say, “Why yes, you may – and thank you for asking.” Jagger has learned that when he hears that, it’s like a click. He will say hello and then turn his attention right back to me, which is the goal. I then explain to people that he does that because he wanted to say hello to them but he must keep his attention on me. That’s his job. So far, we’ve been shopping together to find the right kind of dog food, and camping together. We will be going camping at least two more times this summer, then again in the fall for a seven day trip at Lake Erie. I hope to take a bus trip to see the Baltimore Orioles in September, and we’ve been approached by the Lions Club and the Order of the Eastern Star to attend one of their meetings and give a presentation. Once the heat breaks, we’ll be attending a knitting club in town once a week. I let him sniff the trees and get the “dog beat” news. We also go walking around the town tennis court looking for abandoned tennis balls. Around December, we’ll be going to Harrisburg for our six-month recertification, and we’ll be heading back to Harrisburg in May for graduation. 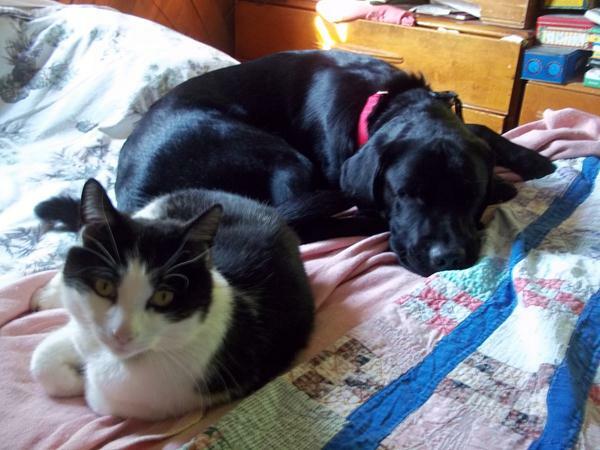 I’m also hoping the weather cooperates so Jagger and I can go to PawsAbilities in March. Next year, in between camping next spring and summer, I’m hoping to fly down to Arkansas to visit my son. I’m also hoping to go to Michigan and Ohio. Jagger and I have a lot of plans. We dream big! It’s International Assistance Dog Week, a week devoted to celebrating assistance dogs and the way they support their partners to live more independently. We can’t think of any better way to celebrate this week than to have some of our partners share their stories of their service dogs. My name is Greg Traynor, and I am a person with a disability (spinal cord injury, paralyzed from the chest down). I have a wonderful service dog named SSD Misty Morning, and she is a Susquehanna Service Dog from Harrisburg, Pennsylvania. 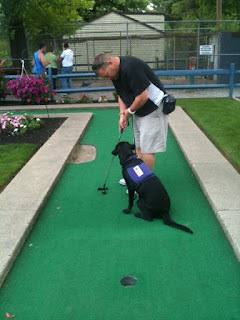 Misty is my second service dog from SSD. My spinal cord injury happened in 1999 because of a diving accident. I was 31 years old at the time. I was working independently as a senior field auditor, traveling the country for a national shoe company. 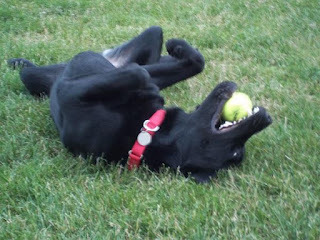 At the time of my injury, I had a Labrador retriever puppy named Buddy. For my entire life, I have been a dog person and loved Labrador retrievers. But because of my injury, I had to give Buddy away. When I was in rehabilitation at Shepherd Center, a specialty spinal cord injury hospital located in Atlanta Georgia, I was introduced to service dogs. Once a week, a local group would bring service dogs into the gym to interact with all the patients. It was fun to play with the dogs and great physical therapy at the same time. I made it my goal to obtain a service dog as quickly as I could. After completing my rehabilitation and moving back to Pennsylvania, I placed an application with SSD and obtained my first service dog, Nala. We were a working team for 11 years before I had to retire her because of her advanced age. Nala went to live with my attendant and continues to do so, even at the age of 15. I want to explain my relationship with my service dog. If you are reading this far into my post, chances are you are a dog person as well. 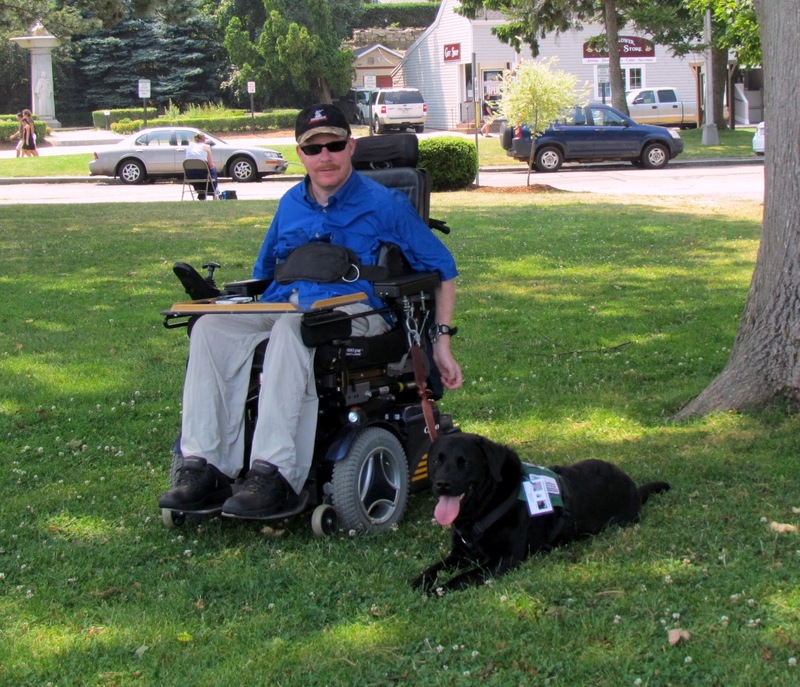 Having a service dog is so much more than loving a companion dog or family pet. 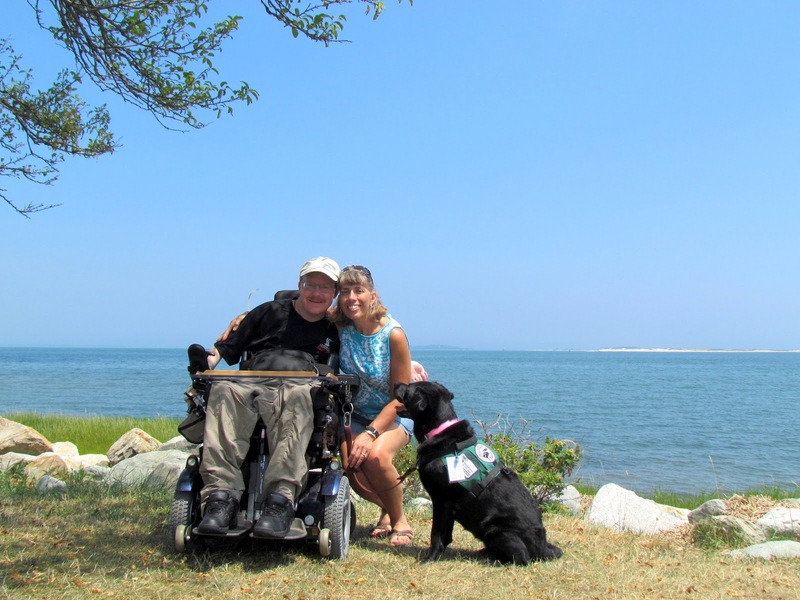 Misty enables me to live as independently as possible and not rely on 24-hour attendant care. She is my hands, my confidence, my companion and a trusted friend. Without Misty, I would not be able to stay alone, run my business, or function as well as I currently do. Not only does she retrieve objects and carefully place them on my tray table (mounted on my power wheelchair), but she can go and get help in case of emergencies. This was particularly important last month when I was having trouble breathing in the early morning. I am unable to cough independently to clear my lungs. I was struggling to breathe, and I gave her the command to get help. She opened the bedroom door and went upstairs to the bathroom and literally got Beth out of the shower. Beth quickly came downstairs and assisted me with coughing so I could breathe again. 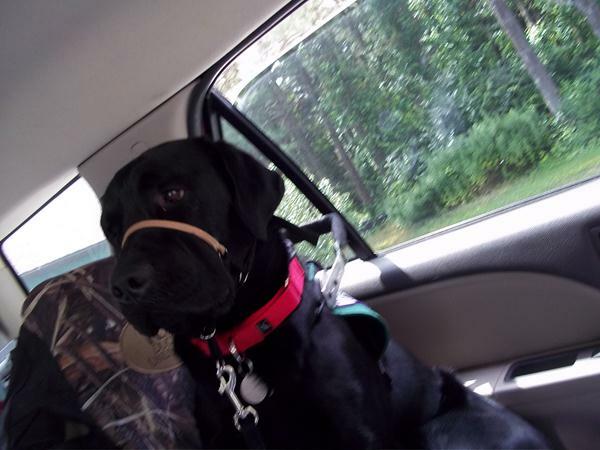 There are hundreds of stories like this that happened over the last 12 years, of my service dog coming to my rescue, saving the day. As I write this, she is sleeping beside my wheelchair, being my friend and letting me know she is always at my side. I am so grateful to Susquehanna Service Dogs and all they do to enable and empower individuals with disabilities on a daily basis. Our service dogs and service dogs in training love to read, especially when kids read to them, and that’s why we’re very excited that Books-A-Million invited us to participate in their bookfair on Saturday, August 11! We’ll be at Books-A-Million in the Park City Mall in Lancaster, PA with a bunch of our dogs from 1-5 p.m. Please stop by and say hello! Some of our demonstration teams will be there to demonstrate service dog skills, and many of our other dogs in training will be wandering the aisles and browsing through the books. Plus, if you present our bookfair voucher to your cashier, a percentage of your purchase will be donated to Susquehanna Service Dogs! Download your voucher here. We hope to see you at Books-A-Million on August 11! The Shakespearean puppies had their first official outing today. They visited Highmark Blue Shield for their United Way campaign kick-off event. Thank you to Highmark and the United Way for inviting us to be one of your featured organizations at the event! Hamlet, Brutus, Falstaff, Queen Mab, Cleopatra, Portia, and of course, Bill Shakespeare had a blast at the Highmark building. Several of our puppy raisers and puppy sitters work there, so first the puppies got to meet many of our puppy raisers’ and sitters’ coworkers. The pups took over a conference room and played until most of them fell asleep. Then it was on to the main event! 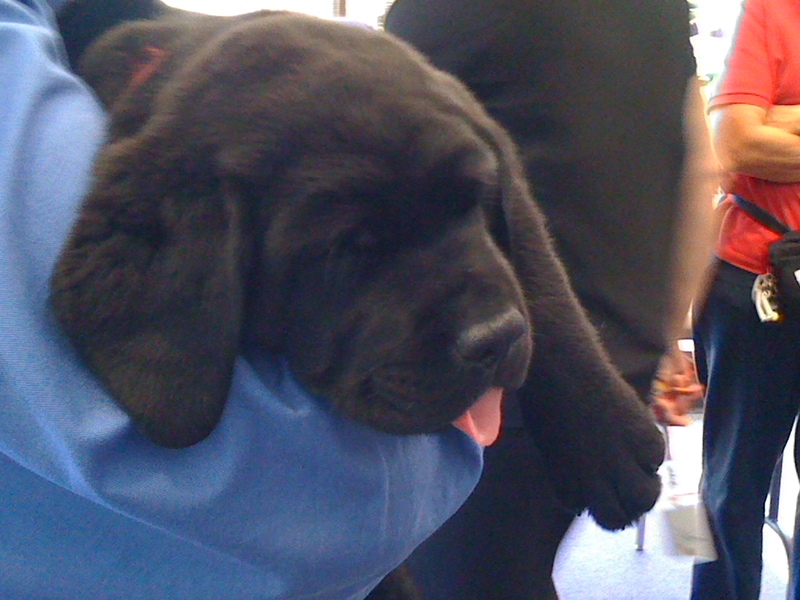 Our volunteers and some of the wonderful employees at Highmark carried the sleepy puppies down to the cafeteria, where the United Way kick-off event was being held. There, the puppies were passed from one set of arms to the next as they greeted and snuggled with Highmark employees. One employee said that getting to pet and hold the puppies was like waking up on Christmas morning! The pups certainly put smiles on everyone’s faces. The puppies benefited from all the attention, as well. Meeting so many new people is an important part of the puppies’ training. They need to learn that all different types of people are friendly. Every single person who interacted with the puppies today was helping them on their journey to becoming service dogs. Thank you to everyone who has or will donate to the United Way in support of SSD! The United Way is a wonderful organization that raises money for the needs of the community, and SSD is a part of the United Way of the Capital Region. Many company and groups, like Highmark Blue Shield, hold large campaigns to raise money. If you would like to join Highmark in supporting the United Way and SSD, you can make an online donation. If you choose to support SSD, please remember that you need to designate your donation to SSD using this code: 7024DOGS. The puppies and their future partners thank you!